It’s time again to dispel some common myths about yoga. A yoga practice is for anyone, at any time, anywhere. Don’t let yoga misconceptions stop you seeking to start a practice or broaden an existing one. Check out our first post to learn about 5 other Yoga Myths that Yoga District debunked. Read the myths below to learn some truths about yoga and feel reinvigorated to make it part of your life. Bodies’ needs and conditions do vary. Yet yoga is often an ideal way to relieve pain. It can heal injuries from a variety of sources, especially with chronic pain. Studies show that yoga can provide relief (1) for individuals who suffer from pain brought on by arthritis, fibromyalgia, and back pain. Performing asanas and practicing yoga targets the various dimensions of chronic pain, including the physical, emotional, and social aspects (2). Try these poses (3) commonly associated with pain relief. Observe how you feel after your practice. You just might find a new favorite posture! Individuals experiencing acute or chronic pain can speak with a teacher about any concerns. Also, they should use modifications during the class. Check with your healthcare provider before beginning a new regimen. Remember to listen to your body’s responses to the practice. People may avoid or give up on yoga because they think it’s too easy. For them standard poses or beginner classes are undemanding. For them the classes do not provide enough of a physical challenge. Yoga is highly customizable and meets a variety of needs and interests. Class names and descriptions usually indicate the level and what to expect from a class. Consider various yoga class that you think would meet your needs. Remember each yoga instructor will teacher a class differently. Check out a array of classes with different instructors until you find the ones with teaching styles that resonate with you. Try a variety of physically challenging practices including: Ashtanga, Power and Rocket. – Ashtanga Yoga teaches a set sequence of postures in a strengthening and athletic way. – Power Yoga encourages students to focus on strength and flowing movement (4). 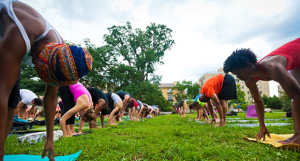 – Rocket Yoga is a playful, strengthening and athletic fast style yoga derived from Ashtanga. You could also always add an element of focus or difficulty to your current practice. Yoga teachers tend to offer a versions for each pose (including more demanding options.) They will often mention ways you could inspire yourself in the practice. Challenging oneself in yoga can take a variation of forms: whether you focus on peak poses, the frequency of your practice, or the mindful and meditative aspects of yoga (5). 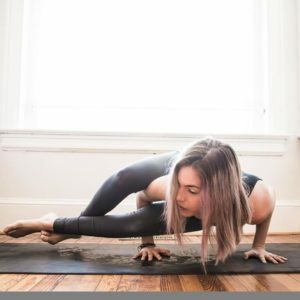 To challenge yourself in a class, check out the Yoga District schedule which features an array of classes at a variety of difficulties.